At this point, we were in the middle of a mild winter. January turned into February, and we decided to look at a house that didn't quite meet our criteria but that was listed for a really great price. We'll call this house The Game Changer House. This house was an old house, but not necessarily the old farmhouse I pictured. There were only 1100 square feet of finished space, which was possibly an issue... the potential to finish the attic space and the basement made this house a possibility though. It was on a busy highway. It was only on two acres which, again, was our bottom limit in acreage. And, probably most importantly, it wasn't located in the area we wanted to live in. The beauty we saw in the house gave us hope, though, especially at the price it was listed at. It had beautiful hardwood floors. It had arch doorways. It had beautiful old doors and trim. It had an old bank barn. The house, though on a busy highway, sat on a lovely property of rolling hills. We went and looked at the house and realized there was mold in the basement. This wasn't a deal breaker for us, but it was certainly a concern we had to look into and consider. We decided if we did buy this house that it wouldn't be a forever home for us. We would buy it and flip it and live in it for 2-5 years before reselling. We thought about it for a week. I was ready to say yes, but Ben wasn't sure, so we decided to let it sit and keep looking. While we said no, this house changed things for us. We started asking questions. We started considering. Should we just flip another house and find our forever home later? Maybe a forever home isn't God's plan for us. Were we holding too tightly to our location ideal? Maybe God had plans for us to live in another town. This was the game changer house for us. When we originally set out on this journey, we were determined to stay within a twenty minute radius of our church. We loved our church and knew in order to remain involved, we really needed to stay close. But as the Lord kept closing doors on houses in that area, and as we considered this house, we wondered if maybe the Lord had bigger plans than we could see. Maybe he had plans to move us. To change towns and to change churches. We weren't sure. But we opened our hands and our hearts and said, "Thy will be done, Lord." In the middle of February, a friend of mine wrote me a message on Facebook asking if we were still looking for a house. She told me she had a friend whose parents were selling their farmhouse and wondered if we were interested. Umyesplease. She shared the son's contact information and we asked her to share ours. We waited a week as we were still deciding on The Game Changer House and we thought the son would contact us. When he didn't, we decided to contact him and let him know we were interested, and we proceeded to set up a time to tour the house. 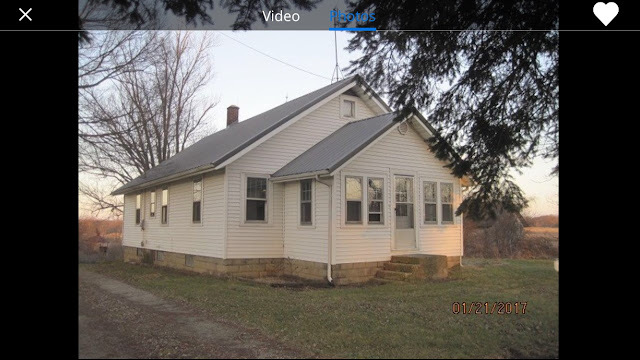 The day before we were set to look at the house, I checked Zillow and saw that the house was listed as an upcoming auction! I was frustrated as the son had never told us this. The auction wasn't until April 1, which was a month away at this point. We decided to go look at the house anyways. We loved so much about it. It was in our perfect location, and we thought, maybe God's plan was to keep us in the same area. It also boasted a wrap-around porch, a big red barn, 5 acres, and was a lakeview property!! A garden and fruit trees, and a newer three-car garage made us fall in love with this house. However, the house was really dated (green cabinets, red carpet, and wallpaper, oh my!) and was an awkward layout for renovating. 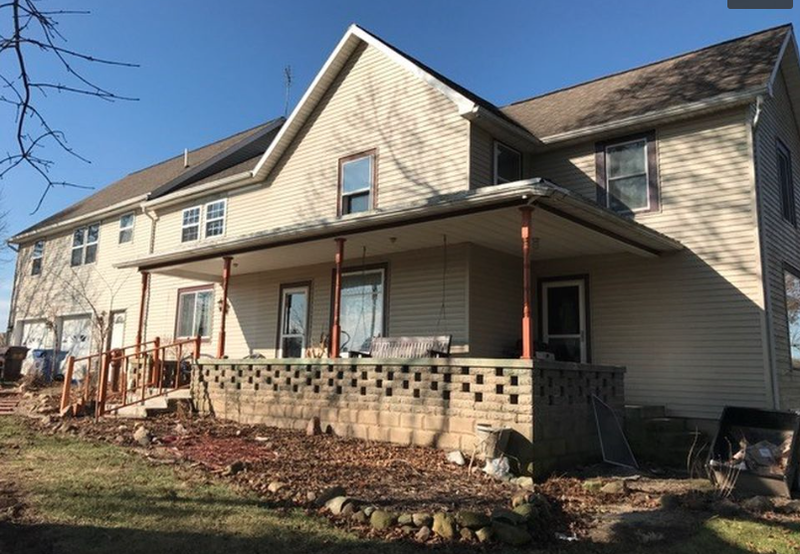 Of course, we wanted something that we could renovate, but this house was already likely to be at the top of our price range because of its location. The auction listing said the owners would entertain offers before the auction, so we put in a good offer. The owners denied our offer and said they were going to wait and auction it. 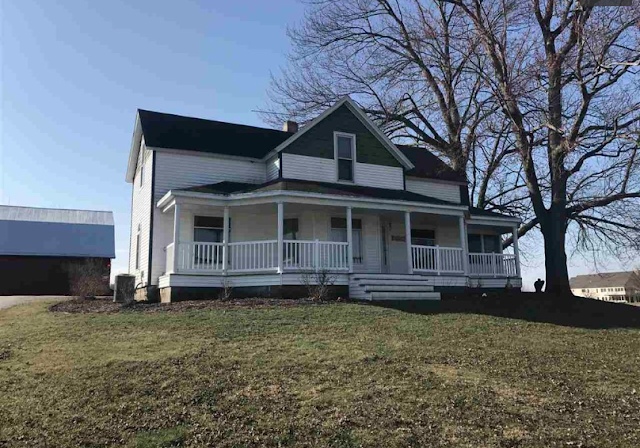 We found out that they had over twenty showings in the first several weeks, so we knew there was a lot of interest, and we expected the house would go quite high. We had a whole month to wait for the auction, so we decided to continue looking for houses. 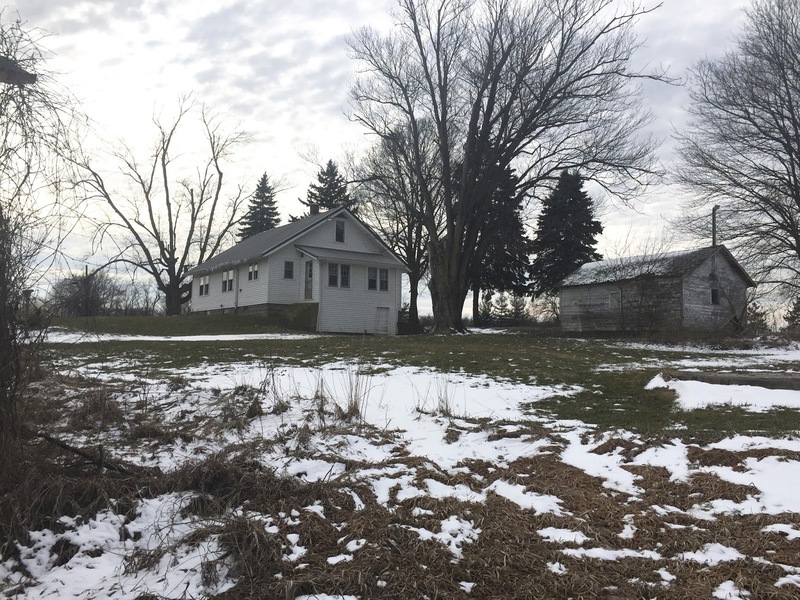 An old farmhouse was listed, but it wasn't in our desired location and there was no barn. We decided to go ahead and look for it as it was a BIG house (2600 sq ft!). 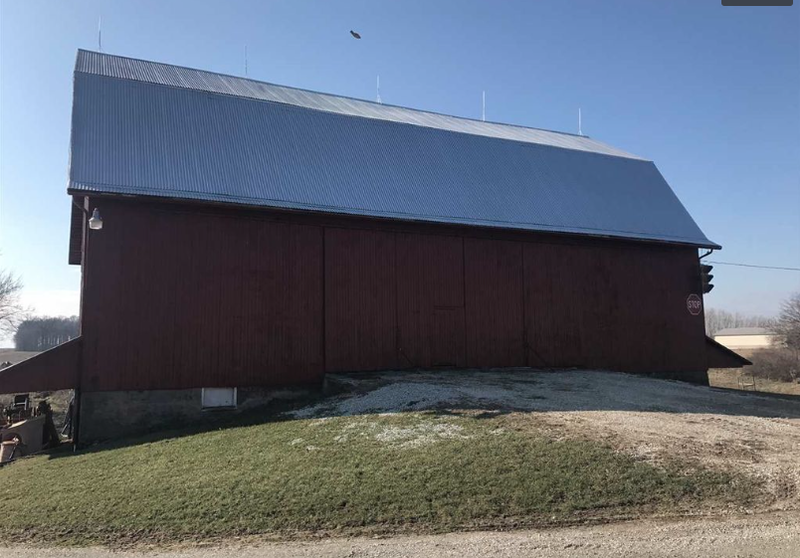 It was also listed at a great price, so we figured we could always build a barn. Upon touring the farmhouse, we found a lot to love. There was an attached garage, it had a workshop, the house had hardwood floors, beautiful trim, old doors, and three bathrooms. There was a front porch, and the house sat on top of a hill with a beautiful view. Our favorite part, though, was that the entire hour that we were at the house, not a single car went down the road! For some people, this would be the last place they would want to live, but we loved the idea of owning a place where our kids could play without us needing to worry about cars and where we could take walks down the road. There were things we didn't love too, though. There was no barn, the house had an awkward addition, the kitchen was small, and the location wasn't close to family, friends, Ben's job, or our church. Despite the things we didn't love, we knew the positives outweighed the negatives, and we put an offer in. We received a counter offer, and we in turn counter offered back. At this point, things started getting weird. The owners were being weird about a few simple requests, and they didn't respond by the time they were given. There were numerous red flags that worried us, and after talking to some trusted friends, we decided buying this home was not in our best interest. After not receiving a timely response from the owners, we had our realtor withdrawal our offer. Though we felt confident this was the right decision, we were still bummed. Another failed house. There were no other farmhouses on the market. We were looking in quite a few towns, but yet, the market was slow. The auction house was still an option, but we still weren't sure if we wanted to pursue this house. We continued to trust that the Lord had a plan, though we often felt like we were preaching this message to ourselves continuously.